This is the ideal result for Kava Kava. Noble varieties are sought after varieties of Kava, and the Vanuatu Noble variety is definitely one of the most coveted. It’s not true in all cases, but in most cases, the origin of a Kava sample can be traced back to an origin point. Here at Wonderland-Labs, we have “fingerprints” for a large variety of Kava from throughout the world. Just like human fingerprints, Kava has its own signature, even when it’s from the same area. This is most definitely a Nobel variety of Kava, and most-likely has come from Vanuatu. How can we know this? The way that the Kavalactones “elute” is very unique for every variety of Kava. 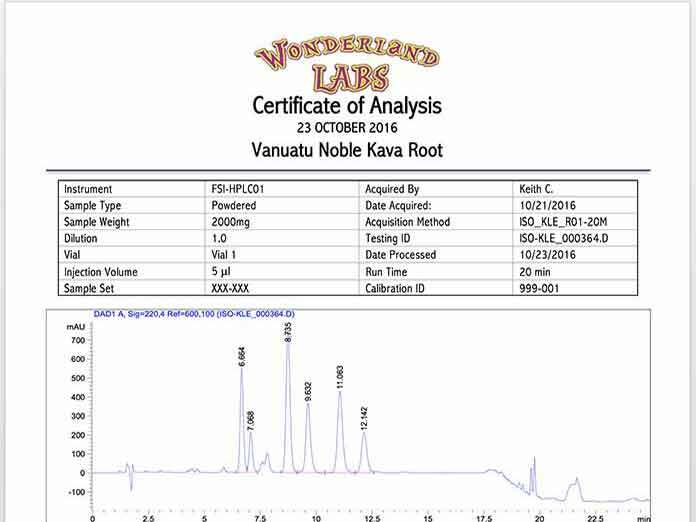 Slightly different times, different size peaks, and different “noise” surrounding the chromatogram (the visual picture of the lactone content of the Kava) give clues as to the identity of the Kava. We have tested some strange products; from purported 30% Kavalactone Kava that was about 5% Kava, and 95% maltodextrin. We tested another powder that was given to us as Powdered Kava Root from Hawaii, but it turned out to have zero Kavalactones in it, and we identified the material as 10% Kava Root and about 90% Ashwagandha powder. And the list truly goes on. Another clue as to the origin of this Kava is the Kavalactone lineup. Notice how this one is a solid 4-2-3 lineup. 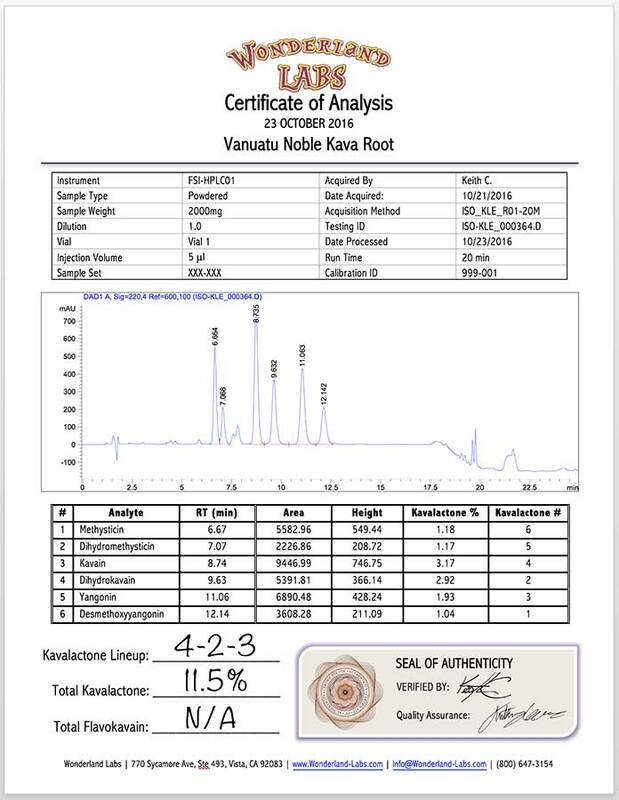 This occurs only in noble root, and this strong of a Kavalactone lineup indicates that this product is pure, and not adulterated with Tudei Kava. Tudei Kava isn’t necessarily “bad” Kava; it’s a faster growing variety of Kava, and in the 1990’s, when demand for Kava was reaching all-time highs, many short-sighted farmers replaced their weaker, slower-growing Kava with faster, stronger, Tudei Kava. Now, it’s a very popular adulterant to pure Noble Kava Root, and it’s actually getting more difficult to find Kava root that hasn’t been touched with some portion of Tudei Kava. Tudei Kava typically has a Kavalactone lineup of 2-5-3. When it’s blended with a 4-2-3 variety, the resulting Kavalactone lineup ends up being a 2-4-3-5, with the “3” and the “5” only being a tiny fraction less than the “3” Kavalactone. For just $99.00, we will provide you with all of this information, as well as a fancy signed and embossed certificate, from a fully registered, beyond-compliant FDA testing facility. We have the fastest turnaround time of any lab for the same price, and we will send you results the instant we complete each test via PDF. We’ve got lab techs who have been personally trained by lab expert Scott Whitney, PhD, and who love testing anything that gets thrown their way. We’re continually updating and expanding our portfolio of herbs that we can test. Something that most people don’t know is that in order to perform a test of a material, we need a pure sample of the material as a reference, as well as an isolated alkaloid that’s contained within the material you’re testing. We need to know what to look for and at what frequency in our HPLC or Gas Chromatography unit, otherwise, we spend a great deal of time measuring different light wavelengths, looking for a peak. And, we specialize in a portfolio of plants that most labs are unfamiliar with. Plants such as Kava Kava, Kratom, Wild Dagga, Kanna, B. caapi, Blue Lotus, Blue Lily, and so on round out our list of GRAS (Generally Regarded As Safe) botanicals that are commonly made into dietary supplements. We’re not limited to these exotic botanicals, but we pride ourselves on the accuracy of our testing results, and the variety of botanicals that our Certificate of Analysis cover for any Lab Certified raw material of finished product that arrives at our lab.